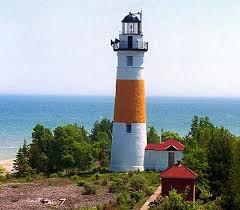 Northeast Michigan is home to seven spectacular lighthouses that help guide ships to safe harbor. Most lighthouses are open mid-May through mid-October. 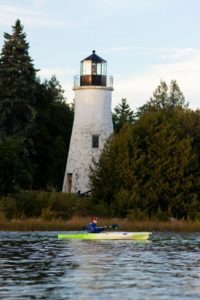 View just one, or all of them, at your own pace, or enjoy a self-guided driving tour of key northern Lake Huron lighthouse coastline destinations! 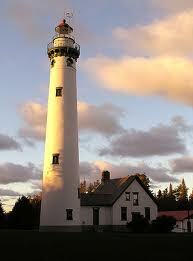 Click here for the northeast Michigan Lighthouse Adventure Guide. Little Red is the only lighthouse within the City of Alpena. The steel skeletal style lighthouse is viewable from Alpena’s boat harbor and breakwall. Built in 1914, it replaced earlier wooden structures which guided ships to safe port since the late 1800’s. It was added to the National Register of Historic Places in 2006. The Presque Isle Light Station includes three historic buildings. 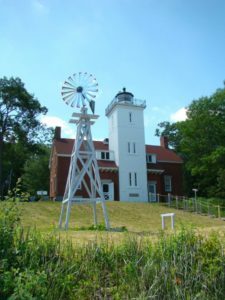 The light tower, which connects to a keeper’s dwelling, was built in 1870 and is the tallest lighthouse tower accessible by the public on the Great Lakes. An unattached keeper’s residence, constructed in 1905, has been painstakingly restored and now serves as a museum. The buildings are situated on a 99-acre township park featuring a playground, picnic area, pavilion, and nature trails. A gift shop is located in the original keeper’s quarters. Visitors, for a nominal fee, may also climb the 130 steps to the top of the tower for a breathtaking view. The buildings and grounds are open from mid-May through mid-October, from 10 a.m. until 7 p.m. daily. The Old Presque Isle Lighthouse is one of the oldest surviving accessible lighthouses of the Great Lakes. 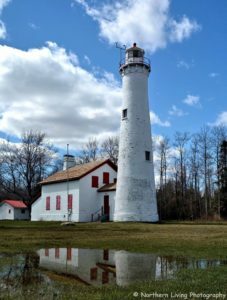 Built in 1840 by Jeremiah Moors of Detroit, the harbor light operated until 1871 when the keeper transferred to a new, taller, coastal lighthouse a mile to the north (The New Presque Isle Lighthouse). Visitors can climb the hand-hewn stone steps of the 30 feet tall tower for a panoramic view of the Lake Huron shoreline and Presque Isle Harbor. The keeper’s dwelling serves as a hands-on museum. Here, visitors can blow foghorns and examine other interesting artifacts. They can also ring the bell from the Lansing City Hall clock tower, and pose for the perfect photo opportunity with head and hands in an old set of stocks. The buildings and park grounds are open to the public daily, from 10 a.m. until 7 p.m. , from mid- May through mid-October. A nominal fee is charged for tower climbs. 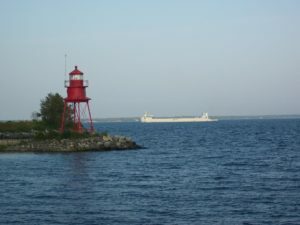 Unlike many Great Lakes lighthouses, Forty Mile Point Light does not mark significant port, but was built so ships would never be out of viewing range of a lighthouse. The light is 40 miles sailing distance from Mackinaw Point. Follow “Shipwreck Trail” to see what’s left of the Joseph S. Fay, one of 27 wooden ships that sank during a fierce storm in 1905. You can see about 150′ of her side wall resting on the beach near the lighthouse. Other features include the steamer Calcite pilot house, a picnic area, swimming beach, and hiking trails. Until the early 20th Century, northern Michigan was almost completely dependent on waterborne commerce for all of its needs. Thousands of sailing vessels and early steamers plied the Great Lakes at a time when there were almost no aids of navigation to guide them along the dangerous coastline with its treacherous rocks, shoals and reefs. One such reef extends 1 1/2 miles out into Lake Huron at Sturgeon Point, just north of Harrisville. 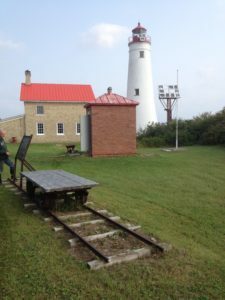 In 1869, the Lighthouse Service began construction of the lighthouse at Sturgeon Point to mark this hazard. Sturgeon Point Lighthouse became operational in the spring of 1870. The keeper’s house is now a maritime museum, which is open to the public seven days a week from Memorial Day to Labor Day Weekend. The lighthouse tower is open to the public. The grounds are open all year. Thunder Bay Island is situated in the center of the Thunder Bay National Marine Sanctuary in Lake Huron. The station was placed on the National Historic Register in 1984. The lighthouse is not open to the public, but can viewed via boat from the water.